The first thing that should be said when looking at the number of incidents of injuries sustained by children on the slopes is that the figures can be misleading. Whilst the statistics will often suggest that they sustain more frequent injuries than adults when participating in skiing and other snow sports, the reality is often that parents are more likely to seek medical advice and treatment for more minor injuries when they happen to have children under the age of 16 than they would ordinarily do for adults. Nevertheless, children are a specific risk group when participating in snow sports for a number of reasons. You’ll no doubt know from your own experiences from when you were younger that children tend to have an entirely unique lack of perception of danger when they’re younger. Experience has taught adults to be wary of particular situations and to take more care, yet children cannot often see the potential dangers of snow sports and can often be fearless which puts them more at risk of injury. Therefore, it’s important that, as parents, children are told about the dangers of particular manoeuvres and of going far too fast for their level of ability and that they are made fully aware about the dangers and how to stay safe. With young children, in particular, you should also inform them about the dangers of misbehaving whilst out on the slopes. To some children, they might confuse misbehaviour with simply having fun or being mischievous but you need to drum it into them that the slopes are no place for this kind of behaviour. It’s imperative that from the very beginning, you insist that children wear ski helmets and protective wristbands. Unfortunately, there is no law to make this compulsory in many snow sports resorts around the world and it is far more likely that a child will sustain a serious injury if they are not wearing a helmet at least. Many people who undertake snow sports tend to hire equipment, unless they’re extremely enthusiastic. Therefore, when you take your children on a snow sports holiday, the chances are that you’ll expect to be able to hire suitable equipment for them too. However, the reality is that many resorts still do not include wrist bands as part of the hire equipment package and that there are often problems adjusting the ski bindings for children. Furthermore, although buying equipment is quite costly, one of the major contributory factors in children sustaining injuries on the slopes is because they’ll often be using equipment which has been passed down to them by older siblings. This should be discouraged as, in many cases, the equipment is outdated, worn and unsuitable for the child in question. All ski equipment should match the child’s height, weight, boot size, conditions of the slopes and their level of experience. It’s also the case that the physical make-up of children is different to that of adults which can make them more prone to certain medical problems. For example, their skin is thinner than that of an adult which puts them more at risk of sun damage. They also have a proportionately larger body and head surface area than adults which makes them more exposed to heat loss. Children are also likely to suffer from dehydration far more quickly than adults. No matter how proficient you, as a parent, are at a chosen snow sport, you should still enrol your child in an instruction class which suits their level of ability. Firstly, they are far more likely to listen more intently to an instructor who will also have specialist knowledge of teaching children not only how to master the rudimentary basics properly but who will also be more up to speed with the dangers and safety aspects of the specific snow sport. 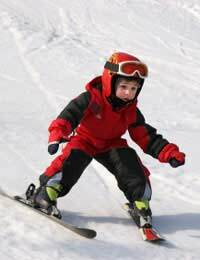 Ultimately, it’s a combination of the right instruction, a child’s awareness of the dangers and a respect for the slopes along with parental guidance and proper fitting equipment which is in good condition that should ensure that the risks of injury to a child are minimised as much as possible.